Industrialized Agriculture is addicted to chemistry in the form of pesticides. The addiction was marketed to the American People, along with other post World War Two miracles such as nylon stockings and the ball point pen. The pen and the nylons, of course, ultimately proved much less dangerous than the chemical fix for company profits. Today, well over 33 million pounds of fumigants are used in California agriculture each year with over 9 million of cancer-causing chloropicrin alone. For strawberries grown in the state, fumigants account for 87 percent of all pesticide use. A 2014 report by the California Department of Public Health (DPH) found that fumigants dominate the top five pesticides of public health concern sprayed and spread in close proximity to schools. A disturbing new study out of UCLA’s Sustainable Technology & Policy Program found, in a case study of three fumigant pesticides commonly applied together in California, that “these pesticides may interact to increase the health risk for California farm workers and residents” and regulators do not exercise their authority to regulate the application of multiple pesticides to prevent or decrease risks to human health. According to Dr. Ann Lopez, Executive Director for the Center for Farmworker Families, the most at risk are the children in their formative years, who are impacted at local schools, located near the growing fields, and are constantly being exposed to the extensive drift of these dangerous fumigants. Dennis J Bernstein spoke recently to Dr. Lopez and to Mark Weller. Weller is Program Director for Californians for Pesticide Reform. DB: Let me start with you Dr. Lopez. Give us a little bit of background on the chemicals we are talking about, in terms of the spraying near schools. How dangerous is this chemistry. What we know about the multiple impacts. AL: Well, the researchers actually worked with three different pesticides, that are frequently used in California. Two in particular are very distressing because they are used in strawberry fields almost everywhere. The first one is chloropicrin which is a carcinogen. … We inherited it from World War II as so called vomit gas because when you sprayed it on the enemy, in the war, they would have to remove their face mask in order to vomit. Chloropicrin causes poisoning of the lungs, skin and the digestive tract. And the other one that’s of major concern is Telone or 1,3-dichloropropene. This one is another cancer causing chemical. And it’s also neurotoxic, and impacts fertility. And I’ll come back to the neurotoxic part shortly. 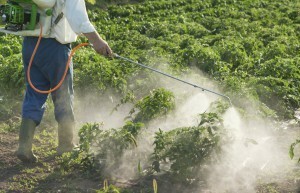 But what they did is they studied the impact on the body, of combination of pesticides. In other words, what happens when children are exposed to chloropicrin and Telone, either in succession or as a mixture. And they found that each pesticide potentiates the impact of the other. So that what happens is you get a combined effect that’s much greater than you would get with either one individually. And they work by dismantling the detoxifying mechanisms of the body, the so-called co-factors, like glutathione. And they also impact the DNA. So they alter the DNA in a way that could put the cells on the path to cancer. So this is basically what they discovered. It’s the first study of this kind that I’ve seen. And the reason that it’s so distressing is because these chemicals are not like liquids or solids that you just dump on the ground and that’s the end of it. They stay in that location, rather, they’re mobile. They are vapors that move over the ground. And so when we have these narrow buffer zones around residences and schools, like we do, right now it’s only 1/4 of a mile. This stuff can move over the ground, and just move right into the classroom or the playground, and impact the children. I think this is terrible. This is very, very distressing. So that is the concern and it’s just a thumb nail sketch of the study, itself. DB: And Dr. Lopez, say something about the impacts that we know, in terms of specifically on children, because we’re talking about spraying these cancer causing chemicals near schools. These are kids in the formative years. I imagine this has a special impact, the kids are more vulnerable. AL: Absolutely. Yes, the growing bodies of children are much more vulnerable. They take in a whole lot more liquid than adults. And they take in more air. So they are bound to absorb a lot more of these chemicals. And, it’s distressing because the neurotoxins effect the brain and spinal cord. And I have worked in the areas where this study was done, northern Monterey county and Santa Cruz county for about 18 years, with farm workers. All of them, every family I’ve ever talked to wants their kids educated and out of farm work. So what we do is we send the most oppressed, the poorest, and the voiceless, essentially, to these elementary schools where we spray right near the school. And these children go to school hoping to become educated and have a better future, and we’re subjecting them to chemicals that can potentially alter their brain and spinal development. I just think it’s unconscionable. DB: And this is observed in terms of their actual behavior. AL: Exactly. The autism rate at UC Davis’ study showed that the autism rate increased, I think it was ten times, or what was it? Five or six times in a ten-year period, in the state of California. There’s a direct link between ADHD, autism…many of these kinds of brain damaging pesticides result in these conditions, even pre-birth. I wanted to mention one other thing, if I may, and that is, in today’s Santa Cruz Sentinel there is an article on the right hand side of the front page, about how the commercial crab season has been canceled again, or at least delayed because the crabs themselves have a potent neurotoxin called domoic acid. And I think it’s so interesting that the California Department of Fish and Game would cancel the season in order to protect the public from eating crab with a potent neurotoxin, and yet the Department of Pesticide Regulation will do nothing to stop these fumigants that are neurotoxins that affect children almost every school day. DB: Also joining us is Mark Weller. He’s Program Director for Californians for Pesticide Reform. You were part of this press conference today. Maybe you could put this into context in terms of this community, how dangerous this situation is, and if, in fact, it’s not part of a larger problem. MW: Sure. There were parents and teachers from Ohlone Elementary School there. I think, Ohlone Elementary is a really good way to kind of capsulize what’s happening all over California. So, Ohlone Elementary is a school of 500 children, K through 5, 97% Latino, 96% sociologically disadvantaged, you know, by state standards. And teachers and parents there have been battling pesticides for decades. In fact, in 1999 the civil rights lawsuit against the California Department of Pesticides included Ohlone parents of students there. And they charged the state with discriminatory regulations by allowing for disproportionate number of Latino children to be exposed to hazardous pesticides. Now this case was settled. It was still being challenged, however, in 2011, that’s 12 years later. And … the Department of Pesticide Regulation accepted no guilt. But they agreed to install a pesticide air monitor on the grounds of the Ohlone Elementary campus. Now, so this has been going on … the air monitoring testing since the very end of 2011. And the state sets the lifetime cancer risk, their regulatory target for air concentrations of 1,3-D or Telone that Dr. Lopez is talking about in the study. That’s a standard that is 10 times more lenient than in Europe. So it allows for 10 times more before California considers the level dangerous. But we should be clear, the European Union has banned 1,3-D and chloropicrin, and in fact all the pesticides studied in the UCLA report, as well as 6 of the 8 that are most used pesticides near Ohlone Elementary. So what did the state find in the air monitoring testing? Well, in its first full year of testing in 2012 the level was 14 percent above the cancer risk level at that elementary school. And over the last 3 years, the average has been 93 percent of the state’s cancer risk level. So it’s just under the state regulatory goal. But, if that’s not enough to say “Enough already, with allowing our children to breathe this poisoned air.” The UCLA study tells us that the state just under the risk level figure is, most surely, understated. Because it doesn’t take into account the presence of other fumigants which combine with 1,3-D to magnify cancer risk. And indeed chloropicrin does that and indeed chloropicrin is applied in huge amounts at Ohlone Elementary School. So the DPR [Department of Pesticide Regulation] is, right now, drafting a statewide policy about regulations for pesticide used near schools. And so they must consider this information, about the combined effects of pesticides, when making that policy. And if they can’t ban … if they don’t ban this stuff like they have in Europe the least they can do is push this stuff as far away from school children as possible: a mile, at least, is what we’ve been calling for. DB: And Mark Weller, let me ask you, we know that there’s a lot of corporate money, a lot of lobbying money, the major corporations have a lot to say about whether these kids are going to continue to be poisoned. Could you talk about that part of this struggle? MW: Well, look 1 3-D is manufactured by Dow, Dow AgroSciences. This is that toxic air fumigant that causes cancer and the state was so worried about it that it was banned in California, between 1990 and 1995. It was brought back by hard lobbying, and successful lobbying, extremely successful lobbying by Dow because it is now one of the most used pesticides in the state. DB: Dr. Lopez, I’d love to hear more from you about what happens among the families that you work with, when they find out about this. When they know about this. Is there a sense of a growing resistance? We know that it’s not easy to complain particularly if you happen to be undocumented. You may be being poisoned but if you speak up you may end up being poisoned, and then getting deported. AL: Right. That’s absolutely correct. Eighty-three percent of farm workers in Santa Cruz county are undocumented. Seventy-five percent statewide. So they tend not to say anything. And it’s very depressing. I actually told one farmworker family that has children that go to Ohlone School. I told them, I said “Keep them home.” If I were that parent I wouldn’t allow them to go to school and be subjected to this. And I think there needs to be a ground swell statewide of protests at the state level insisting that the DPR [Department of Pesticide Regulation] does it job. It has a mandate to regulate pesticides. It’s not doing its job. Why are we paying their salaries, with our tax dollars? I think this is disgraceful, and in Santa Cruz county, the south county is mostly brown, and many, many farm workers. The north county is mostly anglo, or white. And in the north county we have these laws about crab fishing so that white people don’t eat crab with neurotoxins. But it’s perfectly okay to spray brown children with these awful neurotoxic chemicals. I think this kind of environmental racism. It’s a civil rights issue, Dennis. I mean this is absolutely intolerable and unconscionable. DB: And so Mark, what comes next on this battle? Where do you see this going? And how will you try and call more awareness to what’s going on? MW: I think what’s next in the battle is pushing, and pushing, and pushing on the state regulators to make as strong a policy as we can get them to make regarding pesticide use around schools. We really have this important historic moment. There’s never been anything like this. The Department of Pesticide Regulation has never done a statewide policy that can be so far reaching as one to address all the schools in the state to make them more protected. And that would be a big step forward. They are drafting their policy right now. It’s delayed. You know, of course, our concern is they may be listening to other forces, that we discussed earlier, like Dow. So we have to keep the pressure on now, with news conferences, with meetings with community leaders, and elected leaders. DB: Any teachers speaking out? MW: Yes, they are absolutely speaking out. They are at the forefront of this because they’re concerned about their students. DB: As well as their own health, I should imagine.